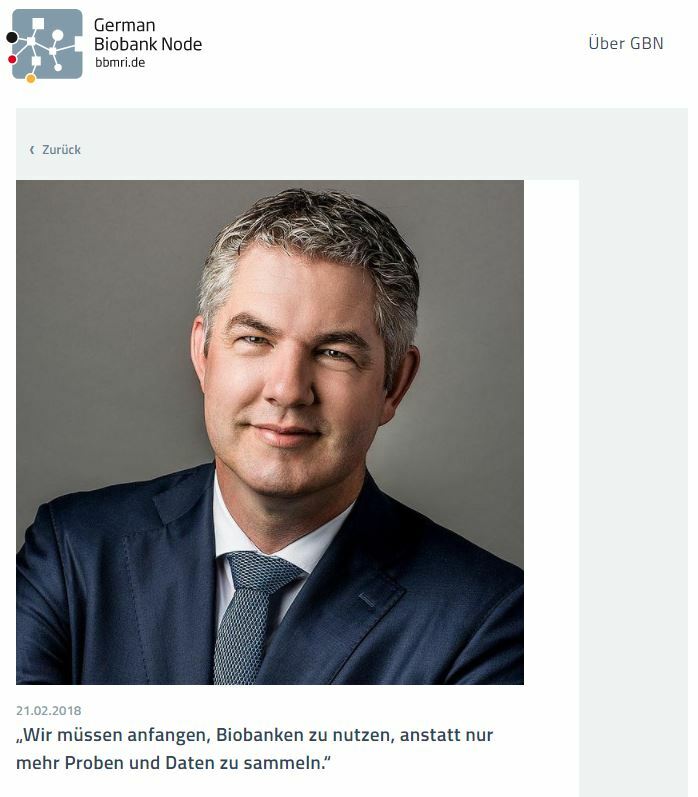 German Biobank Node has just sent out its first newsletter this year, featuring a completely revamped design. This issue is only available in German at the moment. However, the newsletter will also be available in English in the future. Click here to read the newsletter in German. You can read the interview with Erik Steinfelder in English below. Mr. Steinfelder, you started the year with an ambitious work program. Tell us a little bit about the goals of BBMRI-ERIC in 2018. One of the main focusses of our 2018 Work Programme is communications. The best service in the world is of no use if nobody knows about it or if the only ones that understand what it is about is a small group of experts in the field. This means that we need to develop a better understanding of our stakeholders while establishing what the needs and requirements of the pharmaceutical industry and the expectations of policymakers are. Ultimately, we also need to increase our awareness of what motivates patients and the general public to keep sharing their data and donating samples. This new approach will allow us to give more support to our National Nodes, which can then, in turn, offer their biobanks increased support. One of your major goals is to build and strengthen value-added, sustainable biobanking. What does that exactly mean? One of the conclusions we came to during Global Biobank Week last year is that biobanking is not about hoarding, it is about unlocking value – the value of sample collections and data. That is essentially what I mean when I say ‘sustainable’ – we need to start using biobanks, rather than just collecting more samples and data and archiving them. As for the added value, I strongly believe that we, as a European research infrastructure, can make a difference. However, this requires that we deliver on our commitments, shifting towards a more service-oriented organisation. Our ultimate goal is to make new treatments possible. If we channel all the efforts that biobankers across Europe are making, we are much more likely to reach that goal. What is your vision on how the National Nodes can contribute to reaching these goals? We are in contact with all kinds of organisations, companies, and policymakers on the European level. However, the differences between the individual countries in Europe can be quite substantial. That is why we need to work closely with the National Nodes, share experiences, tell each other about use cases etc., in order to make the most of our work. Take communications as an example: It is extremely helpful for us if our National Nodes share any news we might have. We have a large network, of course, but the National Nodes can help us share information on a more regional and local level. In turn, we help them get their message across on a more international level. You started your role as Director General in 2017. What do you consider the most exciting part of your new role? I quite like the combination of public and private, meaning that you are the go-to organisation for the National Nodes while also being their voice on the European level and making sure we are on the European agenda. The other thing is working with my dedicated team in Graz. The diverse professional backgrounds and different skill sets people bring to their job allow us to draw from a wide range of expertise, which is great. Before starting your position at BBMRI-ERIC you worked as Biobanking Commercial Leader at Thermo Fisher Scientific and you have a background in management. What impulses will you provide as BBMRI-ERIC’s Director General considering your business-related professional background? One of the first things I did was introduce monthly update reports and key performance indicators. Just because we are a not-for-profit organisation does not mean we do not have to be efficient. Monitoring our performance in a transparent way helps us make sure we are still on track and allows us to react if necessary. In addition, it gives the governance bodies a better insight into our activities, challenges, and focus areas for the months ahead. In general, I am trying to take a more proactive approach, rather than being reactive. What are the major challenges of BBMRI-ERIC that you would like to address in the next three years? While BBMRI-ERIC has a clear focus on biobanking, we need to keep in mind that it is just one part of a longer chain. We have to make sure that we do not operate isolated from others. Rather, we have to work closely with other organisations to be able to really provide something that is of added value. The second point is that we need to place greater emphasis on digital science. The future is all about data.